This is part three of a series of articles about a Bayesian solution to the Unseen Species problem, applied to data from the Belly Button Biodiversity project. In Part One I presented the simplest version of the algorithm, which I think is easy to understand, but slow. In Think Bayes I present some ways to optimize it. In Part Two I apply the algorithm to real data and generate predictive distributions. Now in Part Three, as promised, I publish the predictions the algorithm generates. In Part Four I will compare the predictions to actual data. Background: Belly Button Biodiversity 2.0 (BBB2) is a nation-wide citizen science project with the goal of identifying bacterial species that can be found in human navels (http://bbdata.yourwildlife.org). In an effort to explore the limits of transparent science, I have started publishing my research in this blog as I go along. This past summer I wrote a series of articles exploring the relationship between Internet use and religious disaffiliation. This "publish as you go" model should help keep researchers honest. Among other things, it might mitigate publication bias due to the "file drawer effect." And if the data and code are published along with the results, that should help make experiments more reproducible. 1) I am working with data from the Belly Button Biodiversity project; this data was used in a paper published in PLOS ONE and made available on the web pages of the journal and the researchers. The data consists of rDNA "reads" from 60 subjects. In order to facilitate comparisons between subjects, the researchers chose subjects with at least 400 reads, and for each subject they chose a random subset of 400 reads. The data for the other reads was not published. 2) For each subject, I know the results of the 400 selected reads, and the total number of reads. 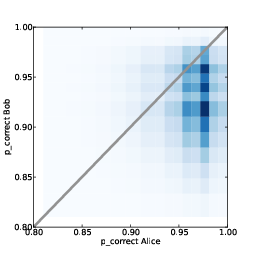 I will use my algorithm to generate a "prediction" for each subject, which is the number of additional species in the complete dataset. 3) Specifically, for each subject I will generate 9 posterior credible intervals (CIs) for the number of additional species: a 10% CI, a 20% CI, and so on up to a 90% CI. 4) To validate my predictions, I will count the number of CIs that contain the actual, correct value. Ideally, 10% of the correct values should fall in the 10% CIs, 20% should fall in the 20% CIs, and so on. Since the predictions and actual values are integers, a value that hits one end of a predicted CI counts as a half-hit. And now, without further ado, here are my predictions. The columns labelled 10, 20, etc. are 10% credible intervals, 20% CIs, and so on. Reading the last row, subject B975 yielded 1542 reads; in a random subset of 400 reads, there were 63 different species (or more precisely, OTUs). My algorithm predicts that if we look at all 1542 reads, the number of additional species we'll find is between 3 and 14, with 90% confidence. I have to say that this table fills me with dread. The intervals seem quite small, which is to say that the algorithm is more confident than I am. The 90% CIs seem especially narrow to me; it is hard for me to believe that 90% of them will contain the correct values. Well, I guess that's why Karl Popper called them "bold hypotheses". We'll find out soon whether they are bold, or just reckless. I want to thank Rob Dunn at BBB2 for his help with this project. The code and data I used to generate these results are available from this SVN repository. EDIT 2-22-13: I ran the predictions again with more simulations. The results are not substantially different. I still haven't looked at the answers. This is part two of a series of articles about a Bayesian solution to the Unseen Species problem, applied to data from the Belly Button Biodiversity project. In Part One I presented the simplest version of the algorithm, which I think is easy to understand, but slow. In Think Bayes I present some ways to optimize it. Now in Part Two I apply the algorithm to real data and generate predictive distributions. In Part Three I will publish the predictions the algorithm generates, and in Part Four I will compare the predictions to actual data. There are a few dominant species that make up a substantial fraction of the whole, but many species that yielded only a single read. The number of these “singletons” suggests that there are likely to be at least a few unseen species. In the example with lions and tigers, we assume that each animal in the preserve is equally likely to be observed. Similarly, for the belly button data, we assume that each bacterium is equally likely to yield a read. In reality, it is possible that each step in the data-collection process might introduce consistent biases. Some species might be more likely to be picked up by a swab, or to yield identifiable amplicons. So when we talk about the prevalence of each species, we should remember this source of error. I should also acknowledge that I am using the term “species” loosely. First, bacterial species are not well-defined. Second, some reads identify a particular species, others only identify a genus. To be more precise, I should say “operational taxonomic unit”, or OTU. Each subject has a string code, like “B1242”, and a list of (count, species name) pairs, sorted in increasing order by count. Subject provides several methods to make it easy to these counts and species names. You can see the details in http://thinkbayes.com/species.py. Figure 12.3: Distribution of n for subject B1242. In addition, Subject.Process creates a suite, specifically a suite of type Species5, which represents the distribution of n and the prevalences after processing the data. It also provides PlotDistOfN, which plots the posterior distribution of n. Figure 12.3 shows this distribution for subject B1242. The probability that there are exactly 61 species, and no unseen species, is nearly zero. The most likely value is 72, with 90% credible interval 66 to 79. At the high end, it is unlikely that there are as many as 87 species. index indicates which species we want. For each value of n, we have a different posterior distribution of prevalence. Figure 12.4: Distribution of prevalences for subject B1242. So the loop iterates through the possible values of n and their probabilities. For each value of n it gets a Beta object representing the marginal distribution for the indicated species. Remember that Beta objects contain the parameters alpha and beta; they don’t have values and probabilities like a Pmf, but they provide MakePmf which generates a discrete approximation to the continuous beta distribution. pmfs is a MetaPmf that contains the distributions of prevalence, conditioned on n. MakeMixturecombines the MetaPmf into mix, which combines the conditional distributions into the answer, a single distribution of prevalence. 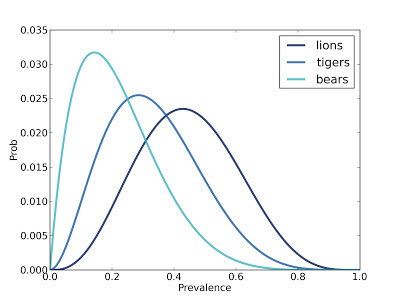 Figure 12.4 shows these distributions for the five species with the most reads. The most prevalent species accounts for 23% of the 400 reads, but since there are almost certainly unseen species, the most likely estimate for its prevalence is 20%, with 90% credible interval between 17% and 23%. Figure 12.5: Simulated rarefaction curves for subject B1242. If we are planning to collect additional samples, can we predict how many new species we are likely to discover? Compute the number of new species, num_new, as a function of the number of additional samples, k.
num_samples is the number of additional samples to simulate. m is the number of seen species, and seen is a set of strings with a unique name for each species. 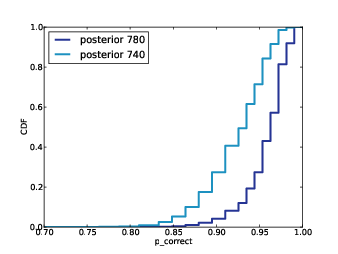 n is a random value from the posterior distribution, and observations is a random sequence of species names. 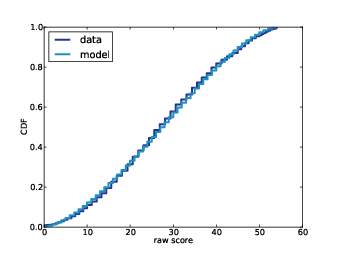 The result of RunSimulation is a “rarefaction curve”, represented as a list of pairs with the number of samples and the number of new species seen. Before we see the results, let’s look at GetSeenSpecies and GenerateObservations. Given a name like Corynebacterium, SpeciesGenerator yields Corynebacterium-1. When the list of names is exhausted, it yields names like unseen-62. Again, num_samples is the number of additional samples to generate. n and prevalences are samples from the posterior distribution. cdf is a Cdf object that maps species names, including the unseen, to cumulative probabilities. Using a Cdf makes it efficient to generate a random sequence of species names. We saw this algorithm for generating prevalences previously in Species2.SampleLikelihood. Figure 12.5 shows 100 simulated rarefaction curves for subject B1242. I shifted each curve by a random offset so they would not all overlap. By inspection we can estimate that after 400 more samples we are likely to find 2–6 new species. 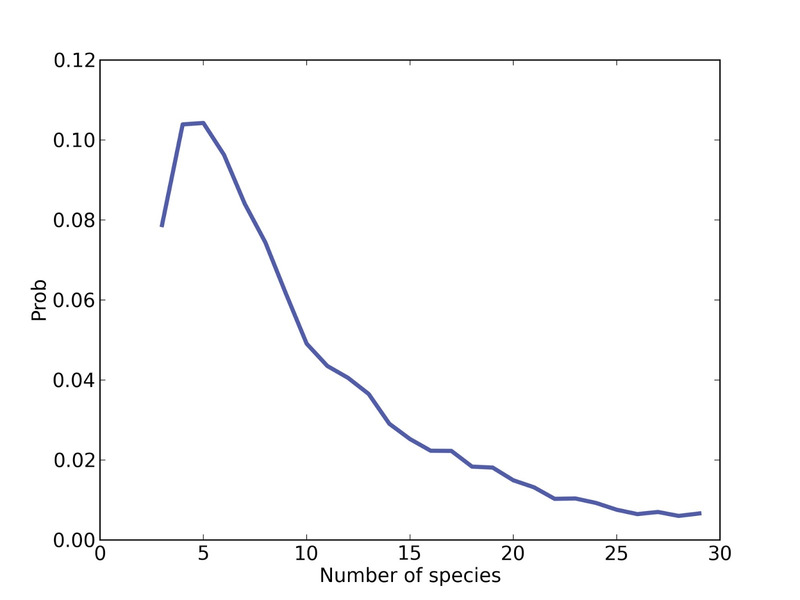 Figure 12.6: Distributions of the number of new species conditioned on the number of additional samples. To be more precise, we can use the simulations to estimate the joint distribution of num_new andk, and from that we can get the distribution of num_new conditioned on any value of k.
MakeJointPredictive makes a Joint object, which is a Pmf whose values are tuples. curves is a list of rarefaction curves created by RunSimulation. Each curve contains a list of pairs of k and num_new. i is the index of the variable whose distribution we want; j is the index of the conditional variables, and val is the value the jth variable has to have. You can think of this operation as taking vertical slices out of Figure 12.5. Subject.MakeConditionals takes a list of ks and computes the conditional distribution of num_new for each k. The result is a list of Cdf objects. Figure 12.6 shows the results. After 100 samples, the median predicted number of new species is 2; the 90% credible interval is 0 to 5. After 800 samples, we expect to see 3 to 12 new species. Figure 12.7: Complementary CDF of coverage for a range of additional samples. To answer this question, we’ll need a version of RunSimulation that computes the fraction of observed species rather than the number of new species. Next we loop through each curve and make a dictionary, d, that maps from the number of additional samples, k, to a list of fracs; that is, a list of values for the coverage achieved after ksamples. Then for each value of k we make a Cdf of fracs; this Cdf represents the distribution of coverage after k samples. Remember that the CDF tells you the probability of falling below a given threshold, so thecomplementary CDF tells you the probability of exceeding it. Figure 12.7 shows complementary CDFs for a range of values of k.
To read this figure, select the level of coverage you want to achieve along the x-axis. As an example, choose 90%. Now you can read up the chart to find the probability of achieving 90% coverage after k samples. For example, with 300 samples, you have about a 60% of getting 90% coverage. With 700 samples, you have a 90% chance of getting 90% coverage. With that, we have answered the four questions that make up the unseen species problem. Next time: validation! This post is a excerpt from Think Bayes: Bayesian Statistics Made Simple, the book I am working on now. You can read the entire current draft at http://thinkbayes.com. Belly Button Biodiversity 2.0 (BBB2) is a nation-wide citizen science project with the goal of identifying bacterial species that can be found in human navels (http://bbdata.yourwildlife.org). The project might seem whimsical, but it is part of an increasing interest in the human microbiome, the set of microorganisms that live on human skin and other surfaces that contact the environment. Based on the number of species observed, can we estimate the total number of species in the environment? Can we estimate the prevalence of each species; that is, the fraction of the total population belonging to each species? I’ll start with a simplified version of the problem where we know that there are exactly three species. Let’s call them lions, tigers and bears. Suppose we visit a wild animal preserve and see 3 lions, 2 tigers and one bear. 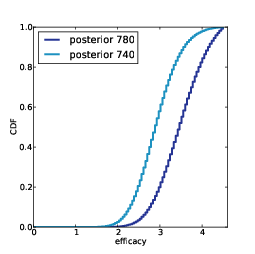 The maximum likelihood estimate for p_lion is the observed rate, 50%. Similarly the MLEs for p_tiger and p_bear are 33% and 17%. We have implicitly used a prior for each species that is uniform from 0 to 1, but since we know that there are three species, that prior is not correct. The right prior should have a mean of 1/3, and there should be zero likelihood that any species has a prevalence of 100%. The distributions for each species are not independent, because the prevalences have to add up to 1. To capture this dependence, we need a joint distribution for the three prevalences. We can use a Dirichlet distribution to solve both of these problems (see http://en.wikipedia.org/wiki/Dirichlet_distribution). 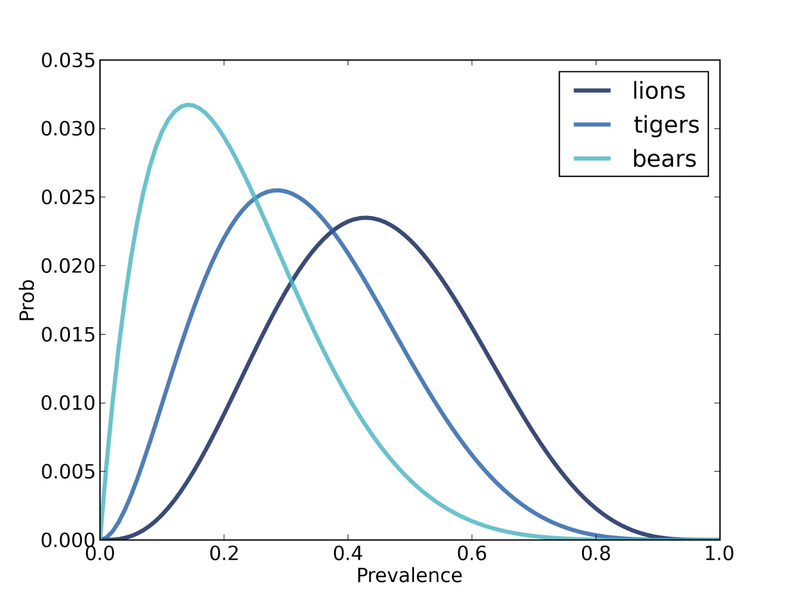 In the same way we used the beta distribution to describe the distribution of bias for a coin, we can use a Dirichlet distribution to describe the joint distribution of p_lion, p_tiger and p_bear. The Dirichlet distribution is the multi-dimensional generalization of the beta distribution. Instead of two possible outcomes, like heads and tails, the Dirichlet distribution handles any number of outcomes: in this example, three species. If there are n outcomes, the Dirichlet distribution is described by n parameters, written αi. n is the number of dimensions; initially the parameters are all 1. I use a numpy array to store the parameters so I can take advantage of array operations. i is the index of the marginal distribution we want. alpha0 is the sum of the parameters; alpha is the parameter for the given species. As expected, the prior mean prevalence for each species is 1/3. Here data is a sequence of counts in the same order as params, so in this example, it should be the number of lions, tigers and bears. But data can be shorter than params; in that case there are some hypothetical species that have not been observed. Here’s code that updates dirichlet with the observed data and computes the posterior marginal distributions. This figure shows the results. The posterior mean prevalences are 44%, 33% and 22%. We have solved a simplified version of the problem: if we know how many species there are, we can estimate the prevalence of each. __init__ takes a list of possible values for n and makes a list of Dirichlet objects. ns is the list of possible values for n. We have seen 3 species, so there have to be at least that many. I chose an upper bound that seemed reasonable, but we will have to check later that the probability of exceeding this bound is low. And at least initially we assume that any value in this range is equally likely. Species.Update invokes Update in the parent class, then loops through the sub-hypotheses and updates them. hypo is a Dirichlet object; data is a sequence of observed counts. Species.Likelihood calls Dirichlet.Likelihood 1000 times and returns the total. Why do we have to call it 1000 times? Because Dirichlet.Likelihood doesn’t actually compute the likelihood of the data under the whole Dirichlet distribution. Instead, it draws one sample from the hypothetical distribution and computes the likelihood of the data under the sampled set of prevalences. 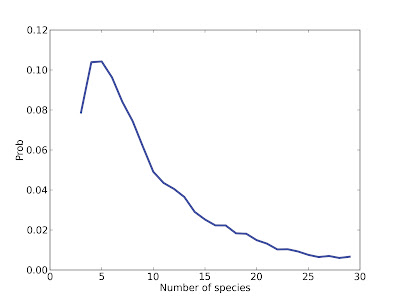 The length of data is the number of species observed. If we see more species than we thought existed, the likelihood is 0.
pi is the prevalence of the ith species, and xi is the observed number. The first term, c(x), is the multinomial coefficient; I left it out of the computation because it is a multiplicative factor that depends only on the data, not the hypothesis, so it gets normalized away (see http://en.wikipedia.org/wiki/Multinomial_distribution). Also, I truncated p at m, which is the number of observed species. For the unseen species, xi is 0, so pixi is 1, so we can leave them out of the product. There are two ways to generate a random sample from a Dirichlet distribution. One is to use the marginal beta distributions, but in that case you have to select one at a time and scale the rest so they add up to 1 (see http://en.wikipedia.org/wiki/Dirichlet_distribution#Random_number_generation). The most likely value is 5. Values from 3 to 8 are all likely; after that the probabilities drop off quickly. The probability that there are 29 species is low enough to be negligible; if we chose a higher bound, we would get the same result. But remember that we started with a uniform prior for n. If we have background information about the number of species in the environment, we might choose a different prior. I have to admit that I am proud of this example. The unseen species problem is not easy, and I think this solution is simple and clear, and takes surprisingly few lines of code (about 50 so far). The only problem is that it is slow. It’s good enough for the example with only 3 observed species, but not good enough for the belly button data, with more than 100 species in some samples. The first step is to recognize that if we update the Dirichlet distributions with the same data, the first m parameters are the same for all of them. The only difference is the number of hypothetical unseen species. So we don’t really need n Dirichlet objects; we can store the parameters in the top level of the hierarchy. Species2 implements this optimization. Species2 also uses the same set of random values for all of the hypotheses. 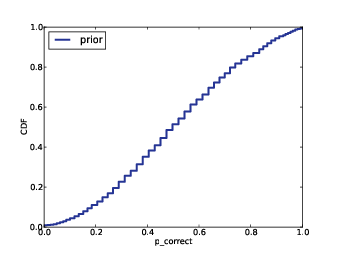 This saves time generating random values, but it has a second benefit that turns out to be more important: by giving all hypothesis the same selection from the sample space, we make the comparison between the hypotheses more fair, so it takes fewer iterations to converge. But there is still a major performance problem. As the number of observed species increases, the array of random prevalences gets bigger, and the chance of choosing one that is approximately right becomes small. So the vast majority of iterations yield small likelihoods that don’t contribute much to the total, and don’t discriminate between hypotheses.The solution is to do the updates one species at a time. Species4 is a simple implementation of this strategy using Dirichlet objects to represent the sub-hypotheses. Finally, Species5 combines the sub-hypothesis into the top level and uses numpy array operations to speed things up. I won't present the details here. In the next part of this series, I will present results from the Belly Button Biodiversity project.